We are giving away a copy of Guild Wars 2: Collector's Edition to one lucky person. Don't miss out, get in here to enter for the prize. When you think about amazing RPGs Guild Wars has to come to mind. We're thinking the same thing, and because of that we are giving away a copy of the collector's edition of Guild Wars 2. The Collector's edition comes with a 10 inch figurine of Rytlock, a plethora of artwork, and some pretty fancy in game items to make the game a little bit more interesting. 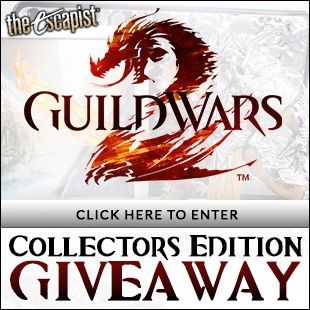 Click here to enter the competition and hopefully win a copy of Guild Wars 2 Collector's Edition. You have from now until April 4th at 11:59pm EST to enter the competition and get your name in there to win your copy. We only have one copy to give away so get in there as soon as possible. We don't say this to everyone, but we really want you to win this. The longer you're staying here reading this, the other guy, the one you don't like, is getting his name in the running for the prize. Don't be the guy to not get their own copy of Guild Wars 2, be the guy that entered into the contest and won that copy of Guild Wars 2.